The American Museum of Ceramic Art, in conjunction with the Claremont Museum of Art, is honored to present HM100: A Century through the Life of Harrison McIntosh. AMOCA’s curatorial department presents an exhibition on the life and work of legendary ceramic artist Harrison McIntosh. Working in his Claremont studio for over 60 years, McIntosh continued to refine his work to strive for perfection and a sense of serenity. Join us to celebrate the life, legacy and 100th birthday of Harrison McIntosh. Exhibition Co-sponsored by Claremont Museum of Art. For more images of the work and exhibition click HERE. 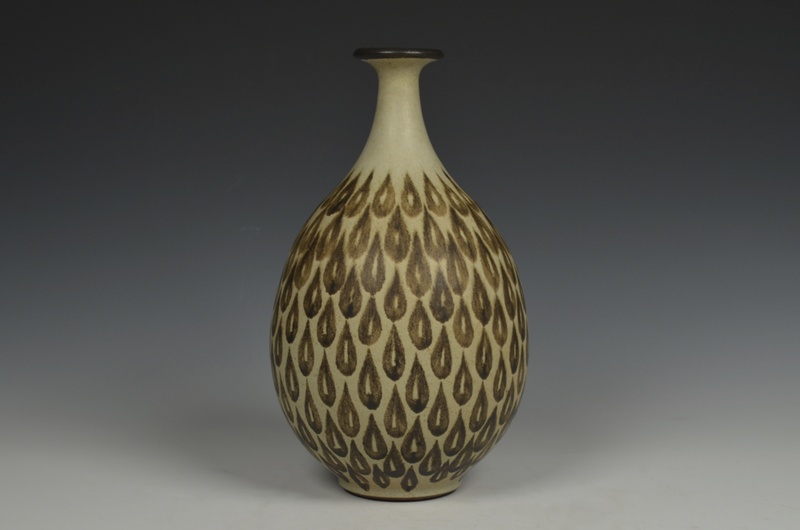 Harrison McIntosh’s long career as a Los Angeles area ceramic artist spanned eight decades. From his modern approach to classical vessel forms in the 1950s, his work expanded to sculptural spheres floating on geometric chrome forms. 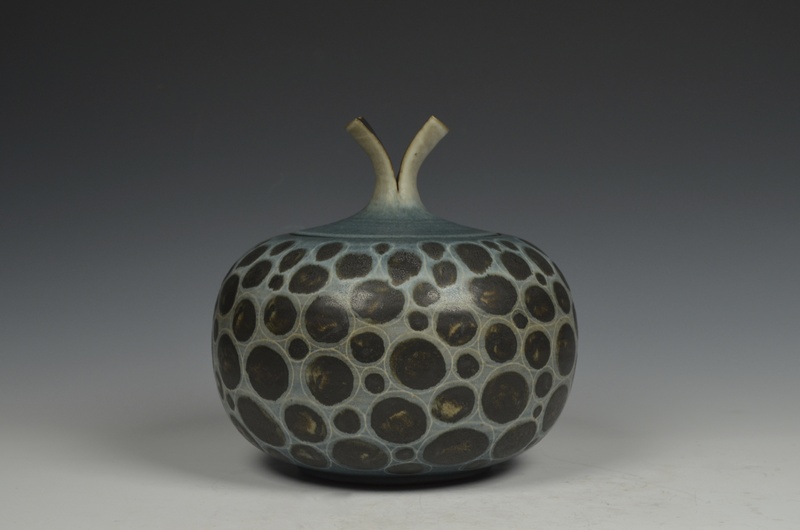 Known for his strong sensual shapes, often enhanced by distinctive surface decoration of thin sgrafitto lines or rhythmic brush spots, his ceramics are held in numerous museum collections around the world. 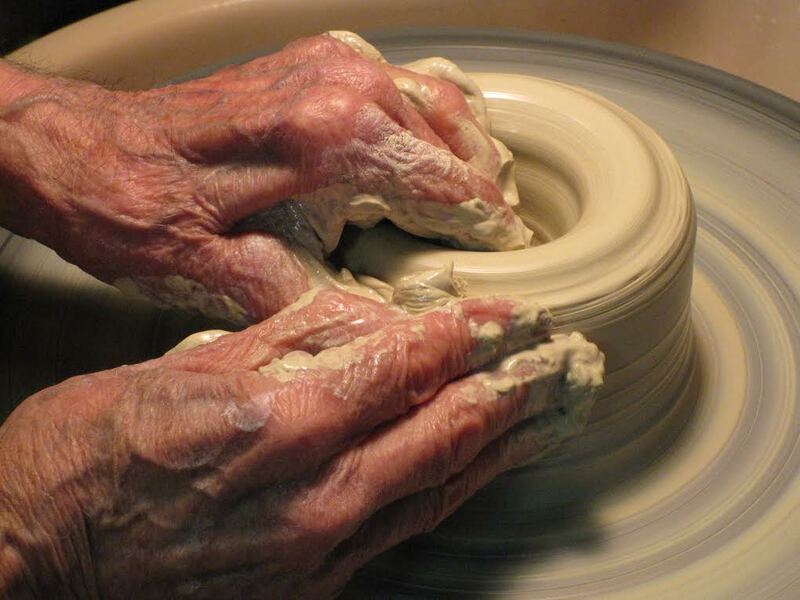 Following his own path, McIntosh chose to build on his foundation in modern design rather than pursue the expressionistic approach to clay that became popular in the 1960s. Working in his Claremont studio, he continued to explore the subtleties of form, both vessel and sculptural, in his personal, thoughtfully deliberate manner. 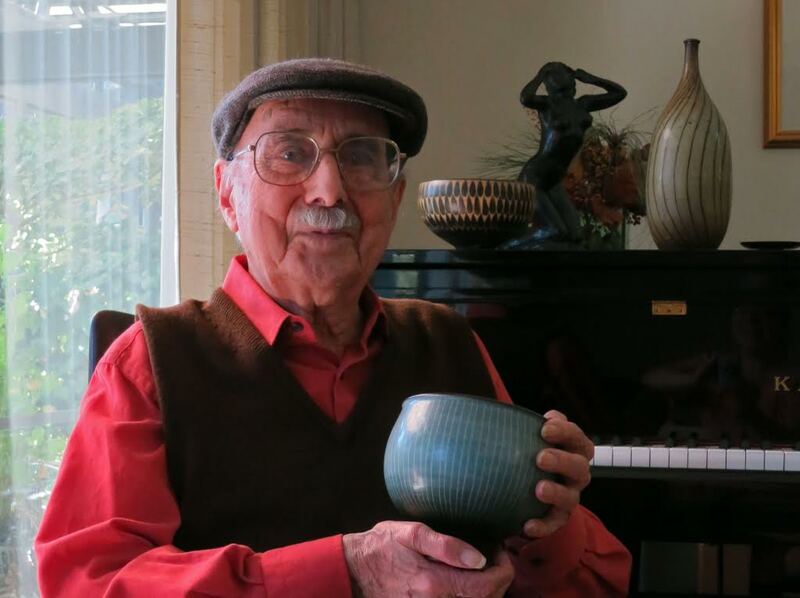 He was one of the first generation of West Coast potters to work with hand-thrown stoneware, a contemporary of Gertrude and Otto Natzler and Laura Andreson. Along with his close friend Sam Maloof, he was among the craftsmen whose work defined California design at mid-century, interpreting a modern esthetic with natural materials. In the early years McIntosh sold his work at home furnishing stores such as Bullocks Wilshire, Van Kepple Green in Beverly Hills and Abacus in Pasadena. In the 1980s and 90s, his work was represented by Louis Newman and later by Frank Lloyd Gallery. While he preferred working in the relative solitude of his studio, McIntosh also designed prototypes for Metlox pottery and tiles for Interpace. With wife, Marguerite, he traveled to Japan each summer throughout the 1970s to design dinnerware and glassware for Mikasa. As his career matured, McIntosh gained an international reputation. His work is represented in more than 40 museum collections including the Smithsonian Museum in Washington D.C., the Museum of Decorative Arts, The Louvre, Paris, National Museum of Art in Tokyo, Boston Museum of Art and locally at the Los Angeles County Museum of Art, The Huntington and American Museum of Ceramic Art. His pieces are represented in over 70 publications. McIntosh has had 43 solo exhibitions over a period of 50 years. He is a Fellow of the American Craft Council, has served as a consultant Panelist for the National Endowment for the Arts, and his personal biography has been recorded in the National Archives of American Art, Smithsonian Institution, Washington, D.C.
As his eyesight diminished, McIntosh’s workdays in the studio faded away. At age 99, he now lives at Mt. San Antonio Gardens where he keeps abreast of the world of art and craft. In September, AMOCA will be celebrating Harrison McIntosh’s 100 Birthday with an exhibition featuring 100 pieces of his timeless creations. Known for flawless curves, Modernist influences and perfectionist work ethic, his work has become part of museum collections all over the world. Join us as AMOCA celebrates Harrison McIntosh on September 27th from 1PM – 4PM by learning to wheel throw and create your own cup or vase. A Collaboration between Amado Pena, an iconic Southwest painter, and Rich Lopez, Southern California ceramicist. These two artists come together in this show creating glazed round tile paintings by Amado Pena framed with ceramic basket patterns created by Rich Lopez. Rebekah’s work transports us to a mesmerizing and fantastic world filled with ambiguous narratives and mysterious creatures. In the artist own words: “Fantasies become realities and dreams become actuality”. Rebekah’s art is also reflective of her interest in gender roles, as she embraces female iconography, “not as a stereotypical taboo, but as an empowered re-contextualization”. © 2019 American Museum of Ceramic Art. All Rights Reserved.